Remember the good old college days when doing more was the norm. I am not talking about just more work – I am talking about doing more number of things. Half a dozen courses in a semester, multiple projects, assignments, sororities, fraternities, science club, that extra research work, volunteering for the local school – all this in addition to working part-time jobs to make ends meet. At any point of time, there were a dozen things that you had on your mind. And it made sense. There was so much to learn and do. The only possible way was to do more. Some of it was mandated for you (by the college rules), the other a result of your passion and eagerness to learn. You wanted to get your hands in many pies. You liked to brag about all the stuff that you were juggling and doing well. The same continued as you started your first job (even worse if you started up your own shop). Although work was more streamlined, specially if you joined a larger organization, but still as a newbie you wanted to do tidbits of everything from doing your work to helping others to volunteering to peeking to see how others do their jobs. Doing so much – and so diverse of it – made you feel cool. Your learning was on fast track. And still it all made sense. After all, life still has a heap to offer and you just did not know enough. The only way to fill that gap was to do lots of things. This do more approach worked well – until it stopped working anymore! Earlier I wrote that an effective way to manage our time is using the model of long walks. The core idea was that we just do not need time free of distractions but we also need it long enough to be effective on a particular task. Smaller chunks of time here and there can never be as effective as a single contiguous block of time. A technique to achieve this is ‘Pomodoro’. 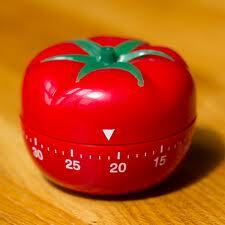 Pomodoro is the Italian word for tomato but the name of the technique is motivated by a kitchen timer. What Pomodoro suggests is to work in chunks of 30 minutes. Every 30 minute ‘Pomodoro’ is divided into 25 minutes of actual work and 5 minutes to reflect and reenergize. The key is that in each of such 30 minutes, you should just work on a ‘single’ task. All distractions and deviations should be eliminated. For example, if I am writing this article, I can dedicate 30 minutes to come up with the first draft. I make sure that I do not check email, attend a phone call or wander in my thoughts to the upcoming vacations. I need to laser-focus on the task I defined before I started.